Lane Foster practices exclusively in the area of personal injury litigation. He has experience with motor vehicle accidents, accident benefit claims, slip and fall accidents, Long Term Disability claims, and various other types of injury claims. Lane attended the University of Manitoba where he obtained his Juris Doctorate degree. Lane was on the Deans’ Honour List, achieving the 5th highest GPA among his class in 2015. Lane also clerked at the Manitoba Court of Queen’s Bench, where he assisted judges with legal research and analysis. While attending the University of Manitoba, he worked as the Senior Editor of the Asper Review of International Business and Trade Law. He was also a Research Assistant for the Faculty of Law and published an academic paper about Canada’s laws surrounding international corruption. 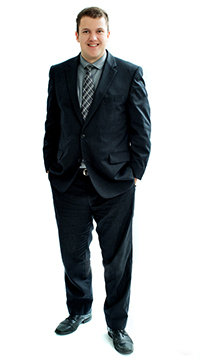 Lane is a member of the Ontario Trial Lawyers’ Association and the Advocate’s Society. In his spare time, Lane enjoys playing soccer, working out, and coaching track and cross country.